The Ark of Noah and the biblical flood have come under an apocalyptic storm of secular scrutiny over the past two centuries, brought about by critical scientists and revisionist historians, including widespread mockery in progressive education. For millennia in the West, the flood story was simply an accepted, solid truth, as part of the turbulent world’s ancient history. Indeed, it has suffered alongside all things biblical since anti-Christian progressives and secular humanists took over Western education, indoctrinating their students with a new materialism worldview. As for this article, I unapologetically present the Great Deluge, circa 2350 BC, as an historic event that devastated the ancient world- be it that readers perceive the ancient world as regional, continental, hemispherical, or even global. I consider it mostly a matter of faith, but too many great flood stories, with animals saved on an ark/boat, are still being passed down in various cultures around the world to view the ancient flood as a purely fictional event. A few of these flood stories share uncanny details with Noah’s Ark, although many Bible critics assert that the Genesis account merely borrowed from them; particularly, the Sumerian Epic of Gilgamesh (ancient Babylonia and Mesopotamia story) is the most widely credited original. In my opinion, we should expect Mesopotamian accounts to share historical details with Genesis. The Torah did not borrow from the Gilgamesh Epic. Moses’ genealogical record and historical events date back to c. 4000 BC, with the biblical flood placed centuries before the Sumerian cuneiform tablets were sensationally written. 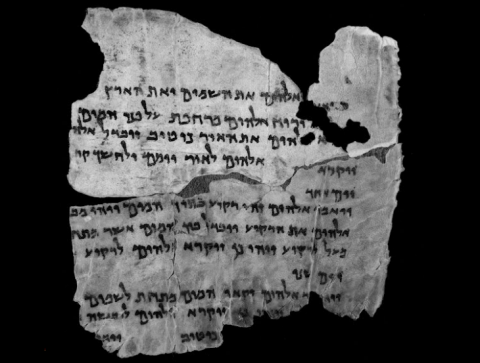 Arguably, it matters little the ages of the copied scrolls/fragments of Tanakh and Septuagint versions that we possess today; they are not the originals. For reasonable minds, it is more likely that a partial truth or an oral tradition of the historical event was passed down and altered by ancient Babylonians, to present a more sensational account to a culture that served a pantheon of gods (with heroic stories similar to Greek mythology). Whereas Noah’s ark can be perceived as a real ship with measurements that could have sustained it in an oceanic storm, the carrier in Gilgamesh’s Epic was a seven story cube that could not have stayed afloat even upon serene waters. Moreover, Moses did not make a myth into an historical event, and Jewish scribes did not plagiarise during their Babylonian Captivity; rather, the Sumerians corrupted the historic event with generations of sensational, oral story-telling, with the story eventually recorded in the distorted and comedic forms that we are aware of today. Comparing Moses’ historical account to the Epic of Gilgamesh is like comparing a W.S.J. article on flooding at a zoo to a U.S.A. Today comic strip of the actual event, showing a fat cat staying afloat on a doghouse. Like the ancient Hebrews, who had oral traditions that expounded on their written accounts, the ancients of Babylonia had oral traditions that they passed down, often by people who did not have access to written accounts. They mixed mythical accounts with history, but Moses feared God and was careful to present the truth to the Hebrews. Not only that, but Moses lived as a prince in ancient Egypt for forty years, with access to the best libraries of the ancient world; thus, even those who do not believe that God guided him in his writings should believe that he would have more accurate knowledge of the great flood in the ancient world. 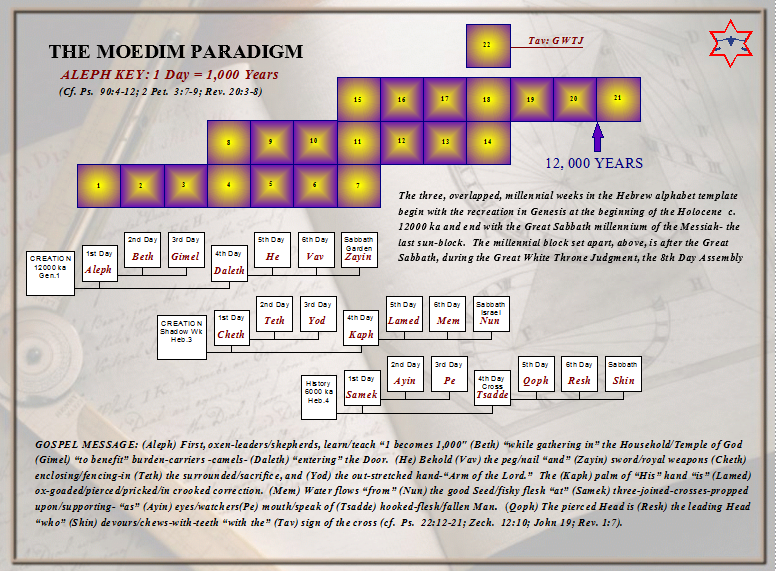 Nonetheless, when the Moedim Paradigm is drawn-out of the flood account, readers will perceive an undeniable link between the Genesis account and the moedim feasts and observances that the Israelites were instructed to keep after the Exodus. This is not proof of Jewish plagiarism from Babylon, rather it is proof of God orchestrating ancient history for prophetic signs. Hence, the Jewish scribes during the Babylonian Captivity could not have written it, for they clearly did not discern the Moedim Paradigm in which I am about to correlate with Genesis’ flood account. In fact, the scribes did not know the meaning to most of the ancient mysteries that they copied and passed down. That being written, the similarities between the Epic of Gilgamesh and Noah’s Ark are profound. Whereas in Genesis God relented of making mankind because of their violence and evil, and their perpetually evil thoughts, the Gilgamesh Epic explains that the gods were angry with the noise of war and bustling humanity, and thereafter decided to destroy all people on Earth. Both heroes were commanded to build an ark to save the world’s animals. In the Gilgamesh account, Ishtar gave the rainbow after the flood, whereas in Genesis, God did. In both stories the rainbow served as a token or promise that God(s) would not destroy the world again by a flood. Yet for many historians the most striking of the shared features is that both heroes sent out a raven and a dove to see if the water was abated. If there is hidden knowledge in the Gilgamesh Epic, which may have begun as an oral exegesis of the historical account, it begs for comparison with what the flood of Noah foreshadows. For example: Noah’s flood is clearly prophetic of tribulations that will come upon Jerusalem. The question becomes, does the Epic of Gilgamesh also describe a ship that relates to Jerusalem? I will explain after showing that the apocalyptic account of Jerusalem relates to the foreshadowing story of Noah’s Ark. The above passage explains that the nations will gather against Jerusalem before the Lord glorifies the city at the coming of the Messiah. Jerusalem has been tossed about as was the Ark of Noah, but God will establish His covenant of peace with her in the future, just as He shared His covenant of salvation with Noah (cf. Gen. 6:18; Ps. 89:2-4). This is why Christ said, “As in the days of Noah, so shall be the coming of the Son of Man.” So the New Covenant of Messiah is comparable with the covenant of salvation that was given to Noah. The ark tossed about in the flood is comparable to Jerusalem being tossed about in tribulations before the Lord comes to save the people and the city during the Apocalypse. As I have written elsewhere, the 12,000 furlongs are a sign of a boundary of time on the nations, according to the number of the children of Israel (see Deut. 32). Revelation shows the manifestation of New Jerusalem at the coming of Messiah. As the ark landed on a mountain when the flood was over, Jerusalem is depicted as coming down upon a high mountain after the Apocalypse. The city of the saved is complete at the end of seven millennial days, which means from Adam to the end of the Great Sabbath of the Messiah. The ark/cube of Utnapishtim (the Sumerian version of Noah) had seven floors that all the creatures, seeking salvation, filled. Out of the dozens of ancient flood stories which contain similar and remarkable parallels, I wrote of the Gilgamesh Epic because it is so strikingly similar to the biblical flood, with patterns that fit biblical prophecy. However, the similarities do not end the conflict over the historical accuracy of Noah’s Ark. If the Scriptures alone declared the great flood, it would not be taken seriously. Yet with many similar stories describing the great flood, critics of the biblical account postulate that it must have been borrowed from one of the others. Hence, unless they find a statement signed by Noah and his seven family members, preserved in fired clay dating back to the exact time of the biblical claim, they will continue to posit that the entire flood “myth” was borrowed from some other culture. Noah mirrors Christ, who said, “Come to Me, all you who labor and are heavy laden, and I will give you rest.” Noah’s generation awaited rain to fall from heaven, but Christ promised an endless fountain of water, saying, “Whoever drinks of this water will thirst again, but whoever drinks of the water that I shall give him will never thirst. But the water that I shall give him will become in him a fountain of water springing up into everlasting life.” Noah walked with God, and God considered him “perfect in his generation (Gen. 6:9).” Those who entered into his work of salvation (into the ark) were saved, because he found grace in God’s eyes. The world was saved through Noah’s covenant, and a new world was born. All these things mirror the covenant of God’s perfect Messiah and those who are saved by His work in relieving a cursed Earth. True salvation comes through the sacrifice of Jesus Christ and the grace afforded us through it. If we interpret the story of Noah as foreshadowing, it is clear that it pictures the storms of tribulations that are coming to the world during the Apocalypse. The water of the Word is sent down from heaven to bring the cursed world into the Great Sabbath of rest and relief. This water of the Word separates those who trust in the promised Savior and those who will not enter His work of salvation. The water of the Word is like a sword that separates; it is death to those who will not enter the covenant of salvation and life to those who enter in by the grace of our Noah. Jerusalem’s troubles are like the ark of Noah, which was tossed around and afflicted until the storm was over. Consider Noah: faith alone could not save his family. They had to be obedient to the work of building the ark. Faith without works is dead, as said by James, the brother of Messiah. The family of Noah worked out their salvation with fear and trembling, building an ark which lifted them above the turmoil that brought death to the world. What if Noah’s family would have said, ‘I have faith that God will save me; there is no need to help build the ark or even enter therein! Grace not works!’ What if the animals had not answered the call of God’s Spirit and refused to go and enter the ark? Many people during Noah’s day knew of him building the great ark, but how many of them had their own faith that God would save them and mocked Noah’s work? Where is it mentioned that they asked Noah to enter into the covenant at the appointed time? Only the family of Noah and the animals entered into that covenant. Noah was the captain of his ship, but the Messiah is the Captain of the salvation of all who have ever lived and who enter His covenant. 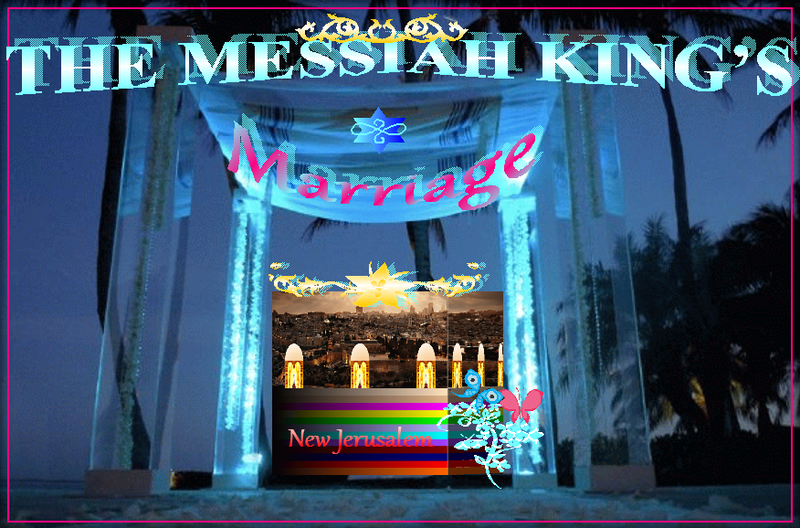 Messiah is the Commander who calls His people near Jerusalem to enter at the appointed time (see Is. 55:4-6). The ark landed on Mt. Ararat in Turkey when the storms were over, but those gathered into the covenant of Messiah will land on Mt. Zion of Jerusalem when the storms of the Apocalypse are over. Noah’s seven family members inherited the earth and entered the rest of a new age, but Messiah’s family from seven days enters the Great Sabbath and restores the world after the tribulations. The animals were brought into the ark of salvation by sevens, called out by God’s Spirit, but the Spirit calls the chosen of seven greater days to Jerusalem for the Great Sabbath. 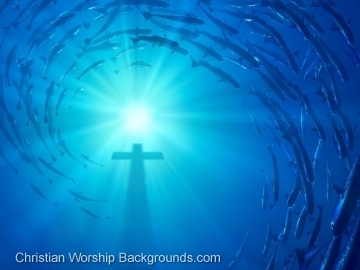 God promises the people whom He calls, to His land, that the waters will not overtake them; He will be with them (see Isa. 43:2-16). For many people it seems evil that God would destroy the ancient world of Noah’s generation, but God is able to give life back and is more concerned with the condition of the soul than preservation of the flesh. The pre-flood world was filled with violence of war (see Gen. 6:13-14). Humankind was falling into a bottomless pit of moral deprivation and rage. That was why the world that then existed was baptized in water, and this is why the world, which now is, will be baptized in fire. But the meek and believing will again inherit the world as did Noah and his family. Thus far, I have shown the storm and flood of Noah to be prophetic of the coming Apocalypse. Noah was a type of messianic savior. His family entered into the covenant that God gave him, which foreshadows the works of God in Christ. Noah brought relief from cursed earth and the elect were saved and inherited the earth with him. The ark is symbolic of the Jerusalem Bride- Jews and Christians whom the Lord gathers during the storm, granting them inheritance in Israel when the storm is over. 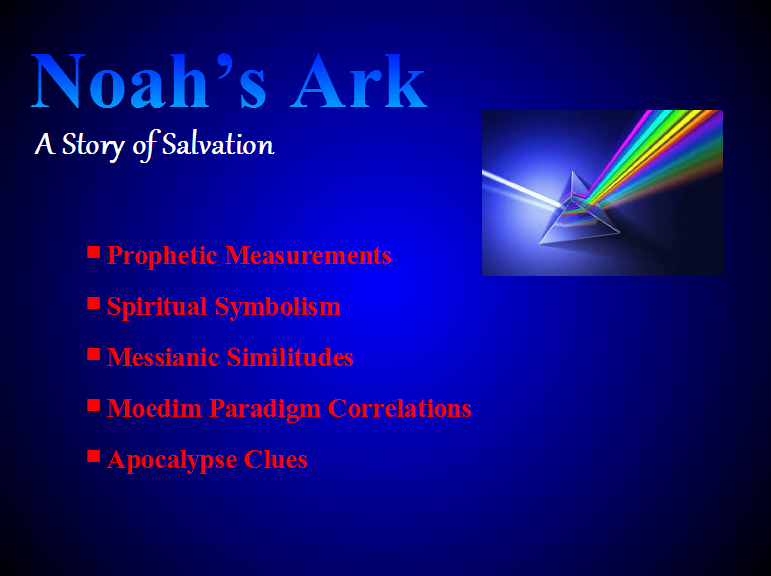 Now let’s go a little deeper in symbolism and look at the measurements of the ark as apocalyptic signs of the times. Here we will find even greater confirmation that this interpretation of God’s foreshadowing work is both true and reliable. The flood story reveals all three weeks in the time template of millenniums, and the theme is God finding a Sabbath resting-place for His people. If someone interprets mysteries or extricates faulty doctrines to clarify the things of God, his or her eschatological teachings should assemble all scriptural details properly, i.e., if the work is wrought by the Holy Spirit and not mere intellectual pondering. Puzzle pieces which do not fit beckon for the proper picture to be assembled. If someone teaches the things of God, he or she must make sure that what is being taught is fully true, for we are accountable to God for things that lead the people of God astray. First, we should consider the amount of time that God gave for His Spirit to strive or struggle with man. If the ark is prophetic of the entire work of salvation, which God builds in the world through Messiah, the years of building the ark should foreshadow the work of salvation God has done through the ages and the coming of the Lord during the storm of the Apocalypse. As for the 120 years, it is exactly the amount of years from Adam to the coming of Messiah during the Apocalypse storm; 120 Jubilee Years comes to 6,000 years of biblical mankind, which is 12,000 years from the beginning of Genesis. When 120 Jubilee Years are complete, all of God’s elect are freed from the powers of the world and are able to proclaim their inheritance in Israel with the Great King. The Great Sabbath is also the Great Jubilee. For readers who are not familiar with this biblical moed (i.e., appointed time), Jubilee Years occur every 50th year, wherein servants must be set free, and those who have lost their inheritance in Israel are allowed to reclaim their possessions and tribal land. Fulfilling the shadows of the Jubilee, God offers a greater time when all disinherited and lost tribes of Israel will be able to return to their land with the Lord. 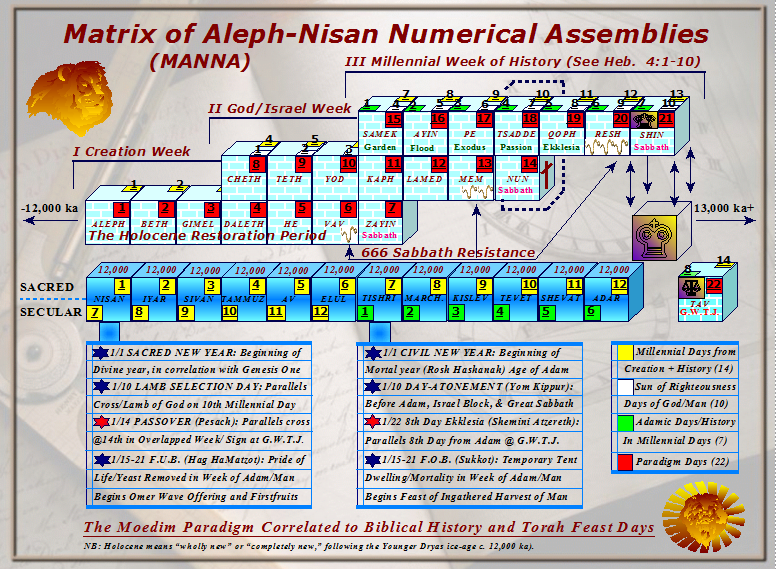 For the cubed ark of the Gilgamesh Epic, I compared the seven floors of salvation with the seven millennial days, from which God gathers His elect for salvation before the Great White Throne Judgment comes, which is on the 8th day. In the ark of Noah, the resounding number is 3; there are 3 floors; it is 30 cubits in height; and the length is 300 cubits. If the Messiah gathers His children from all seven millennial days, why are ripples or tithes of 3 the measurements that God used for building Noah’s ark of salvation? If we continue in the sequence of tithes, we come to the number 3,000. The covenant began at the cross when 4 millennial days were complete. At the cross, people from all seven ages are able to enter into His work of salvation. 3 millennial days remained from the cross to the end of the Great Sabbath. This is why Christ rose in the flesh on the 3rd day, because He comes back in the flesh on the 3rd day since the cross. Yet the Messiah reaches all the way back to Adam. Christ, when He died, went to the Unseen prison realm called “Hades” and preached the Gospel of Salvation to those who were disobedient and died in the days of Noah (see 1 Pet. 3:18-21; 4:6). Every soul must hear the Gospel and its offer of salvation. Finally, there was a window of 1 cubit and a door without measure in the side of the ark. As for the door, Christ proclaimed that He is the “Door of the sheep.” He calls His people in and out, and they listen and follow Him. The window in the ark of salvation simply shows that the saved are not called to be blind to the tribulation, but we are given a window of opportunity to see the works of God. The window was also for releasing the dove and the raven, whereby the dove represents His Spirit. It is like having a heavenly window for granting us heavenly insight, and the measurement of 1 cubit shows that even the smallest measurement in the heavenly vision fits within all His prophetic measurements. The door, being the only feature of the ark that was given without measure, shows that the fullness of the Lord cannot be understood, and those who enter by the Door of salvation are assured that their entrance into His salvation is big enough for all. Though 12,000 of each tribe are numbered as a sign of the time, the people who are gathered into the salvation of the Lord are without measure, as evident in many Scriptures. Besides the prophetic measurements of the ark of salvation, a few more measurements of time are given by the Lord YHVH to assure the readers of the foreshadowing implications in the Great Flood story. Remember, as in the days of Noah, so will be the coming of the Son of Man, when He comes at His appointed time like rain upon the earth. Noah and his family realized that they had to enter the ark within seven days, because on the 8th day the storms of the flood would begin. Likewise, seven heavenly days have been appointed to the people of the world to enter the covenant with Messiah and to become part of New Jerusalem, which is the whole household of God joined to the inheritance of Israel. Blessed are those who enter by the Door into the Great Sabbath, whose seal of salvation is sure against the 8th day cutting away of the Great White Throne Judgment of God. Noah’s ark is on the 8th millennial day from the very beginning, which was the first world death. The final cutting away is a second death on the 8th day. Hebrew males are circumcised on their 8th day, and this is a sign of final judgment and the cutting away of unprofitable flesh- Shemini Atzereth. Yes, there is a judgment on the morning of the Great Sabbath, prior to the revelation of the Great King, but many people will live during the Great Sabbath, and nations are called to repentance through the millennium. At the Great White Throne, when the seven millennial days are complete, there will be no more time to enter the covenant of salvation. The 40 days of rain, wherein the ark was rocked about in the storm, is an appointed time for suffering and refinement and testing for elect people who inherit salvation. The Messiah fasted for 40 days, as did His two anointed witnesses, Moses and Elijah. The sufferings of the elect individuals are a sign of the suffering of the elect generation that entered the inheritance of the Promised Land; they were refined 40 years in the wilderness. The suffering of the elect generation was a ripple or tithe of the refinement of the elect nation, which was Israel when they suffered for 400 years in servitude to Egypt. The suffering of the elect nation is a ripple or tithe of the elect gathered from all over the world, who suffered under death and the demonic elements of the world until Christ died for our redemption at 4,000 years. Thus, 40 days of the storm represent the generation that enter into the salvation of the Lord. This is the generation “hidden in Christ and God.” If we are added into the life of Christ, who lived 33 years on Earth, and the prophetic clock begins again with the 7 years of the Apocalypse, then the generation will be complete and gathered in for the coming of the Messiah, when the sufferings of the Apocalypse are completed. This is the generation that would not pass away before seeing the coming of the Lord. As for the prophetic clock I speak of, it is Daniel’s 70 weeks of years, which is 490 years; one week of years was set apart by the prophet for the coming Apocalypse refinement of the people of God, when the times of desolations of the inheritors is fulfilled with all gathered in. Notice that neither Noah nor his three sons, nor their wives, pulled the door shut; the Lord shut them in. The reason I bring attention to this detail is because it is important to remember during the Apocalypse. Remember that in the parable of the ten virgins, five of them lacked the oil of anointing to light their way to the bridal chamber where the Groom awaited. By the time they could see and went there, the door was shut and the Lord sent them away, saying that He did not know them. There is a national door into the House of David, which is the nation of Israel. This door was opened first to the Jews (Balfour Proclamation of the British in 1917), and it will be opened to the engrafted Gentiles (formerly lost sheep) during the Apocalypse. There will be a gathering east of Jerusalem in the wilderness, as far away as Petra of Jordan. The Lord is the One who opens this door of inheritance into the House of David, and He is the One who shuts it. After seven days, the waters of the flood began to pour down in the 600th year of Noah’s life. Those times point to the two remaining judgments of God on the world. There is a judgment called the Bema Seat of Christ, which comes at 6,000 years, which Noah’s age is a ripple or tithe of, and there is the 8th day judgment of the Great White Throne. Those who are not saved on that eighth day are cut-off by the purging waters of the Word that they have scoffed at. 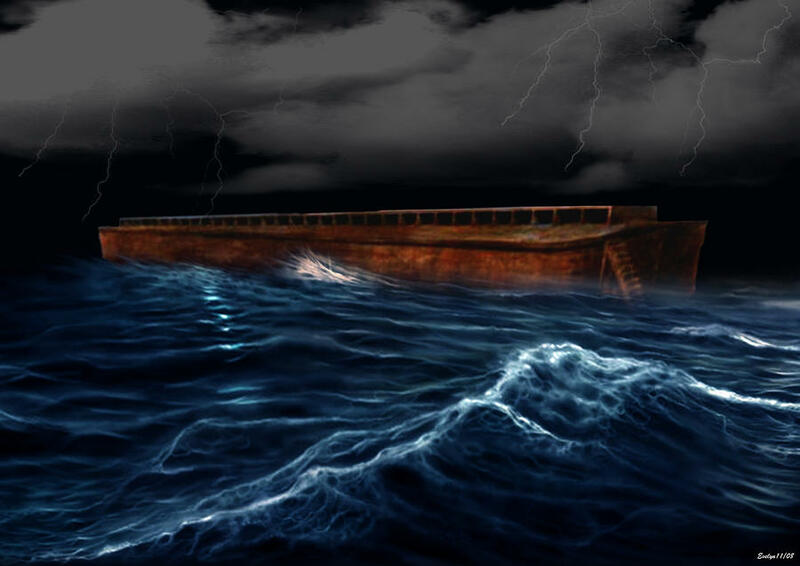 Raging storms, tidal waves, hurricanes, mudslides, and the likes of every possible meteorological disturbance must have rocked the ark in the ancient world like a rubber-duck in a bathtub with a playful toddler. Likewise, the church (ekklesia, “called out” ones) will suffer through the Apocalypse and not have their Rapture; judgment begins in the House of the Lord. As the waters of God’s Word pounds down violently upon the disobedient world, the people of God will suffer and yet be upheld by the raging waters. The Gospel will go out to every nation, declaring both the salvation and judgments of the Lord (see Rev. 14:6-7). And the elect of Jews and Gentiles will ride-out the storm of the Apocalypse as the elect family did in the days of Noah, even until the Lord Messiah arises and calms the waters of the storm. Those who are beheaded during the Apocalypse, by the children of the False Prophet Mohammad, will be resurrected to reign with Christ. There were no self-appointed preachers to renounce their faiths after seeing the carnage floating on the muddy waters. There were no priests to proclaim that their God does not bring such evil catastrophes on the world. Neither were there high-minded, elitist reporters during the flood of Noah, stirring controversies between warring theologies and grief-stricken mourners. There were only the saved in the ark, a demolished world bloated in death, and God watching from above. Funeral processions were nowhere to be found. And the whole time that these raw judgments of God were manifest, His only goal for the world was to have a righteous people to enter into His Great Sabbath rest with Him. From the above passage, it becomes clear that although the Lord seeks the millennial rest, which is His Great Sabbath, He allows storms to stir things up for those who have a little faith, so that they call out to Him for salvation. He is not so much concerned with the dead, whom He is able to bring back, but that His disciples are more focused on following Him through the storms. We cannot concentrate on the dead and on life at the same time, and if we enter into His rest, we must also enter into His storm. Then we can know who it is that the winds and seas obey. After this, the ark rested on the 7th month on the mountains of Ararat, and the waters abated until the tops of the mountains were seen on the 10th month. 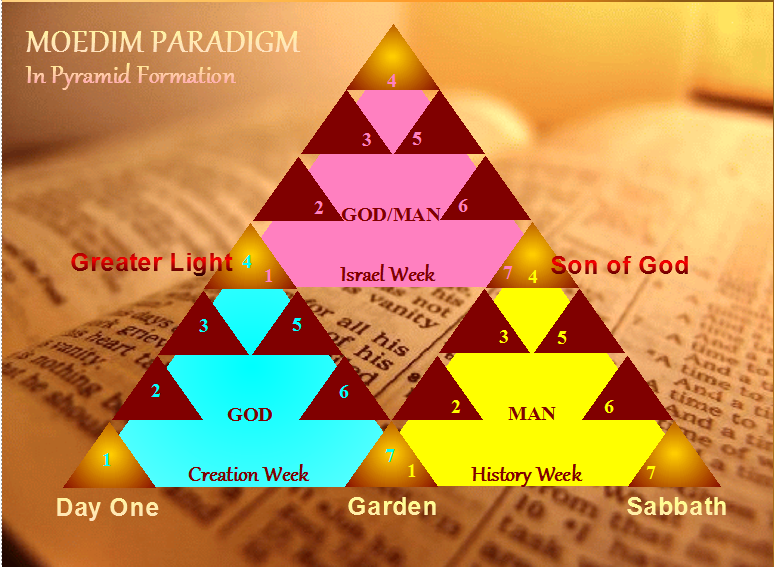 Again, this looks to the rest of Jerusalem coming on the 7th day, which is the 10th day from Israel’s shadow week in the Moedim Paradigm (see template below). On the Great Sabbath, the people of God will rest on Mount Zion of Jerusalem. Israel will have a great Day of Atonement (Yom Kippur). The receding waters of Noah’s ark were complete on the 17th day of the 7th month; this gives a clue that the 7 and the 10 are joined together as one day at the time of rest from the Apocalypse. The waters of the Word decrease all the way back to the cross, which was the 10th day in the shadow week of Israel. Remember that Christ said prior to the storm that He had no place to rest His head, and consider that the journey that the ark was on was to find a place to rest. To this, I call to remembrance the first Great Sabbath in the garden, where Adam and Eve were disobedient and expelled from a millennial rest with the Lord. Israel, too, was offered a Great Sabbath, but missed their 7th day rest with the Lord (cf. Heb. Chapters 3 & 4). When Messiah came to Jerusalem, it was at the end of the Hebrew nation’s 7th day (see Moedim Paradigm); yet the Lord could not enter into a Great Sabbath rest with the nation. On the 3rd Great Sabbath, which is the millennium of the coming Great King, then the Head of the Body of Christ will be able to rest with His people. These truths are brought out in the story of Noah’s ark. 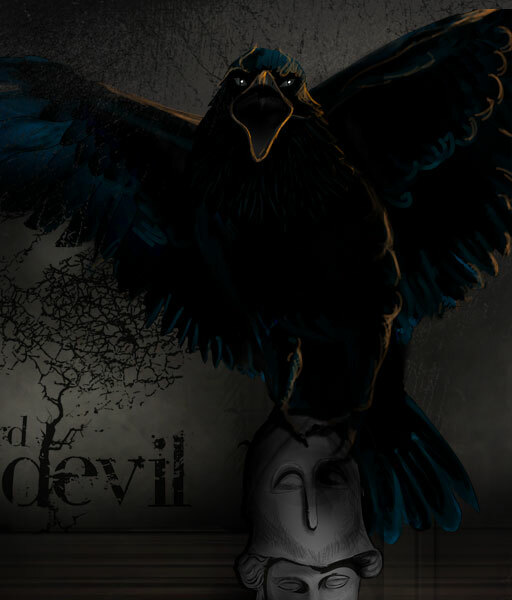 The raven is the symbol of Satan, which goes to and from and up and down the earth, patrolling the waters of the Word for the deaths it brings upon the disobedient (see Job 1:7). The dove, which was sent from the window, is symbolic of the Holy Spirit. The Spirit is sent out to find a resting place for the family of the Lord, and a place for holy Jerusalem to come to Earth. Yet, as the Sabbath garden millennium was missed by Adam and Eve, the Dove of the Spirit found no place for the people of God to rest. The raven of Satan rejoiced to see the death that the water of the Word (i.e., Divine judgment) brought to the world, but the Dove of the Spirit was taken away from the ancient world and returned to God. So Noah first waited seven days, and the dove came back to him, showing no Sabbath for the people of God. This is the missed Sabbath of the garden. Then Noah, like the Lord, waited another seven days, and the dove returned late in the day, showing that she had found a resting place. The sign was an olive leaf, and this, along with the fig tree, is a sign of the nation of Israel. Though Israel had missed their Great Sabbath millennium, God found the perfect place in which He would eventually have His Great Sabbath. Noah and family did not rest at that time, although the Dove of the Spirit confessed Israel with her leaf in mouth; Noah waited another (third) week, which parallels God rejecting Israel for a period of time. This is exactly what the Lord did to Israel after they missed their Great Sabbath. He scattered them throughout the world in the Diaspora. Now, however, the Lord will rest with His people at Israel on the third millennial Sabbath. Those who thought they were wise in the Torah have not known the appointed times of God (see Jer. 8:7-8), but the time has come that all the mysteries of God are being poured out to prepare the way for the coming of the Great King, my Elohim YHVH. And my God will come, and His feet will rest on the Mount of Olives. The Spirit will not return to Heaven, but He will rest in the world at Jerusalem of Israel. This is how things will be for the coming of my Lord. (For those who are still slow to learn these things, I suggest reading Hebrews chapter four until you comprehend these three Great Sabbath periods.) The Lord roars like a lion, calling all His elect together to the land of His coming rest- those who have been spread around the world, for they yet belong to Him. Those who are filled with the Spirit of the Dove know their way home, for they are homing birds, accustomed to migration by design. This will be the greatest gathering of the people of God in history. It will be like the Exodus from Egypt, with all of them assured by the many witnesses and the unsealed revelations of the Word. Jerusalem shall be glorified! Notice that the rain began to fall on the 17th day of the second month (see Gen. 7:11), and that they stepped out of the ark one year later on the 27th day of the second month. Why the ten day addition and not an even year? By now you, the reader, know. The Great Sabbath rest is also the 10th millennial day from the beginning. Again, it is Israel’s national day of atonement- their Yom Kippur. Here, at Mount Zion, will be the fulfillment of the atonement Israel has waited for; here the Lord and the Bride will be unveiled in a wedding feast of victory. 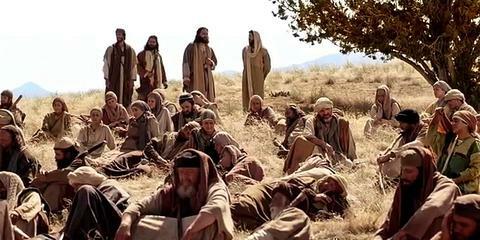 Here the Lord will finally take His rest with His people- a rest that has been coming since the Genesis. Here is where the curse will be defeated for the Bride of the Great king. The covering is removed here for all to see the truth of salvation in the new age. For all the glory that is to come, it is important to remember that first come the storm and flood of troops upon Israel. Jerusalem will be tossed about in tribulations before the Lord touches down at the Mount of Olive Trees, before He brings His people to the strongholds of Mount Zion. Half of the city will be taken away with a flood of troops because they will not listen to the instructions of the Lord. Two will be in the field, and they will take the Jew and leave the Muslim; two will be here and there, and the flood of the Beast will take the Jew and leave the Muslim before the Lord comes to save the great city. This is why the Lord tells His people to quickly flee into the wilderness when they see the Abomination of Desolation in Jerusalem. Those who do not learn to discern the days of the Lord and the signs of the times will be taken away as the flood of Noah (see Ps. 90:3-6), but those who follow the instructions of the Lord will escape the flood (see Rev. 12:15-16). The ark of salvation is the Word of God, and the Word is filled with instruction for salvation, being surer than the ark of Noah. All these things are revealed for the elect who stand at the door to escape; yet many people, as in the days of Noah, simply will not heed the warnings. For those rooted and grounded in the Word, the flood will not overcome them, even as the little olive tree survived the flood of Noah. When the waters of the Word try those who are rooted, they will be able to stand, for the root of the olive tree, which is Israel, has a promise of salvation. But believers who are not truly rooted in the Word will fall away during the coming tribulations (see Mk. 4:5-6,16-17). 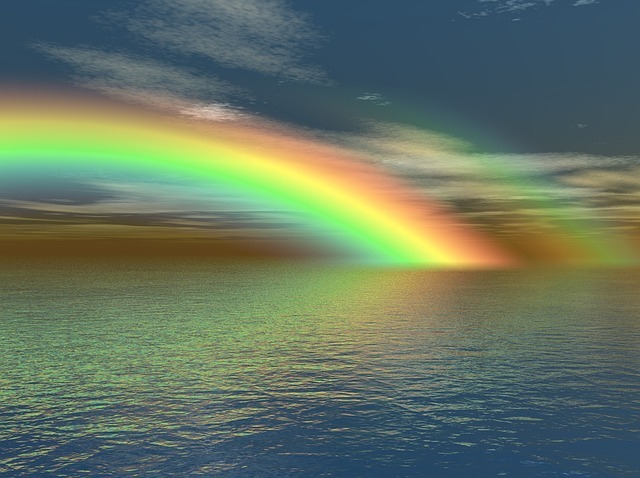 After the flood, God gave Noah the rainbow as a token of His covenant of salvation, saying that He would never again destroy all the earth with a flood (see Gen. 9:11-17). The meaning of the rainbow, and why it is the sign of God’s promise of salvation, will be explained in an article when writing about Joseph’s coat; that is where He gave me a vision and full understanding of it. As is now evident, every aspect of Noah’s Ark was designed with the higher wisdom of the Lord, and every detail fits meticulously together with all apocalyptic prophecies and the signs of the times in which the Lord has given throughout Scripture. This is no patching of ideas, but this is the complete interpretation of an event that the Lord orchestrated to witness to His great salvation of the world through the Messiah.